Using mini level switches can enhance a wide number of processes and machine operation. Whether mini level switches are used in pumps, dispensing systems or even just small liquid holding tanks, they are some of the most cost effective level switches available today. Mini level switches operate based upon two scientific principles, buoyancy and magnetism. The float portion of mini level switches is designed for a specific minimum fluid density, specific gravity, based upon the volume and weight of the float element. The float contains a magnet and the stationary stem incorporates a reed switch which opens or closes its electrical contact when the magnetic element in the float comes in proximity with the reed switch within the stem. The FC/FD series of mini level switches are very compact with the actual size depending upon the specific style or configuration. As such they are easily installed on small machinery and in areas where very little space is available inside/outside the vessel in which they are installed. 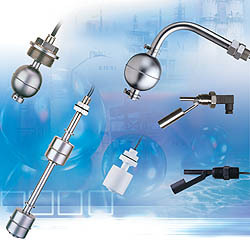 Considerations for use of mini level switches must include the float shape/size, fluid specific gravity, fluid compatibility with the wetted materials of construction as well as the electrical connection with the reed switch output. The float of the mini level switches should always be capable of being used with a fluid specific gravity that is lower than the specific gravity of the actual fluid in the application (S.G. float < S.G. target fluid) so that the float will rise when the target fluid level rises due to the buoyancy of the float. This upward movement of the float will cause the reed switch circuit to open/close. For a further look at a thermal flow switch product line you can visit our FC/FD series mini float level switch product page or download the FC/FD series mini float level switch sales catalog. For more information on the FC/FD series of mini level switches you can contact us at 815-632-3132.